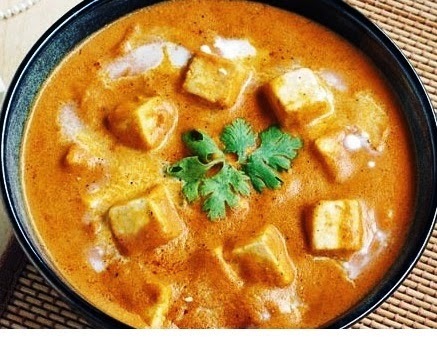 Spicy Badami Paneer is Indian dish which is very spicy, tasty and delicious. you can make it in a microwave or in a pan. It is very simple and easy to make. You can prepared it with very less time. Here a simple steps to make a badami paneer. To make this badami paneer, Combine paneer, turmeric powder, 1/4 tbsp chilli powder, 1 tbsp oil and salt in a microwave proof plate. Microwave on high for 40 seconds. keep aside. Combine the remaining oil and prepared paste in a microwave proof bowl. Microwave, covered on high for 3 minutes, stirring once in between after 1 and 1/2 minutes. Add tomato puree, remaining chilli powder, garam masala, cumin powder, coriander powder and salt. Add paneer, cream / milk and sugar. Microwave on high for 1 minutes. Garnish with ginger and coriander. To make this badami paneer, take a pan add a 1 tbsp oil , turmeric powder,1/2 tbsp chilli powder and a salt. cook it for 30 seconds. Now add a prepared paste and remaining oil. Cook it for 3-4 minutes and stirring once between it. Now, add a tomato puree, remainig chilli powder, garam masala, cumin powder and dhniya powder ( coriander powder). Now, add paneer, milk or cream and sugar. Put this into a bowl.